Flowers ½” across [12 mm]; 5 petals, pink, spreading flat from a tubular base enclosed in 5 sepals; 10 stamens; sepals and stems have straight white hairs; stems deep red to green, the whole plant often turning red after going to seed (third photo); leaves twice dissected, parsley-like, with a rank peanut butter odor (varying from slight to strong) when crushed; annual herbs usually less than 1′ tall (30 cm]. 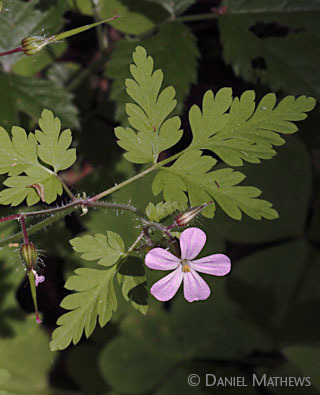 Habitat: weed in low forests, especially in Olympic Mtns. and Columbia River Gorge; WA, OR, BC. Natural History: Most botanists I know call this weed Stinky Bob. They hate it. Don’t fall for its demure charm. It is the one major weed currently known to be able to take over a Northwest coastal forest understory even in deep shade, requiring no disturbance before it invades. It actually achieves greater cover percentages in 90% shade than in more open forest. 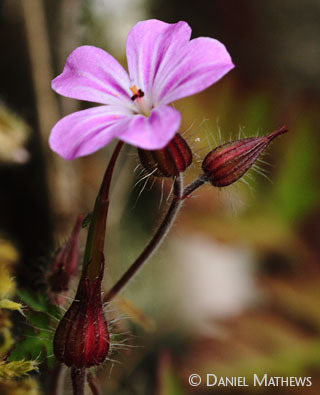 It can shoot its seeds 15 or 20 feet; it can overwinter as a rosette (even under snow) after germinating in fall; it can also germinate in spring, as the seeds are viable for five years; and it produces allelopathic chemicals to poison herbaceous competition. Then there’s that heavy aroma, presumably discouraging to some herbivores. If you spot it anywhere in small numbers before it goes to seed, by all means yank it. 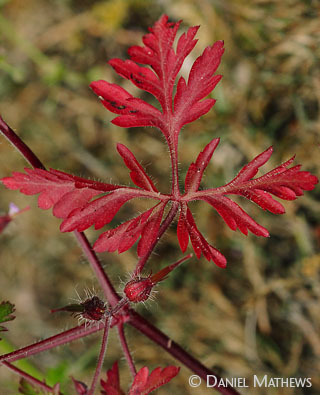 to see it take a major role in the forest herb layer in the coastal Northwest. Over the past three decades I’ve watched it gradually encroach up the trails from the highway on the Oregon side. In 2012 I surveyed 200 random plots on Oregon State Park land in the Gorge. The weed I found in most of the forest plots was wall lettuce, which has been around much longer; but there were never more than a handful of wall lettuce individuals. Stinky Bob, though found in fewer plots, had pretty much taken over the herb layer of some of them—even in undisturbed forest hundreds of yards from trails or roads.